Although I may feel that way, it’s not the complete truth. It is hot no matter how it feels when I’m riding, so I know that I need to take precautions to keep myself cool. This time of year is difficult for so many people, including cyclists. The transition from comfortable – sometimes even cool – temperatures to those that are hot and humid can hit people hard as their bodies adjust and their cycling routine changes. 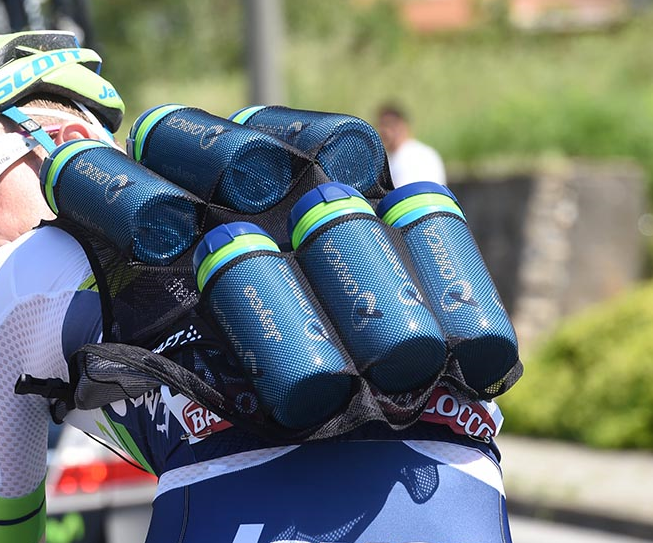 A ride that required very little hydration one week may require two full water bottles the next as temperatures rise along with the humidity. On ride days with high temperatures (and high humidity), what you drink and how much you drink can be the difference between finishing the ride and ending up in the hospital. If you sweat too much and don’t replace the fluids that you’ve lost, your body can enter into a state of dehydration, with symptoms being heat cramps, heat exhaustion, or even worse, heat stroke. Your body uses sweat to efficiently cool you, placing water on the skin that carries heat away as it evaporates. When you become dehydrated your body has less fluid that it can use to cool you down, so the heat that you are generating while cycling builds up. Also as your body works to cool you, it draws fluids from other parts of your body -including your blood – so your blood thickens making your heart work harder to push the blood through your system. When your blood thickens, it can’t help to cool the muscles and flush them of the lactic acid that builds up during exercise. Also, as the blood thickens and moves through your body at a slower rate slower, it affects your mental state causing you to lose focus, become tired and makes it difficult to concentrate on what you want or need to do. The more severe the dehydration the greater the impact on your system. Computers aren’t just for speed and miles! Since I tend to look at my cycling computer during a ride to check speed and mileage, I make a mental note to take a drink at least every five miles. This forces me to drink regularly through a ride at even intervals. Sip, Sip, Sip! It is said that if you wait until you are thirsty, then you’ve entered into the beginning stages of dehydration. Even the slightest level of dehydration can rapidly escalate during a hot, humid ride if you don’t make an effort to stay ahead of it. It is best to take small drinks at frequent intervals during a ride then it is to gulp large quantities less frequently. Thank you for being a friend… Is your friend drinking? Then you should be drinking, too! Use your fellow riders as a reminder and drink when they drink. No one is going to be sprinting away from you if they’re taking a water break, so take advantage of the situation and grab for that bottle. If dehydration hasn’t happened to you yet, and you are riding in hot, humid weather, it’s likely to show up at least once in your adventures. If and when it does, don’t be afraid to speak up. Let someone in your group – preferably the Ride Leader – know that you are not feeling well. It is understandable that no one wants to be the one who causes delays during a group ride, but it is better to slow or even stop a ride to let a rider begin to recover than it is to have to deal with a more serious emergency situation. You will be amazed at how many “mothers,” fathers,” “brothers,” and “sisters” you have on a group ride who will be there for you when you have succumbed to the heat. Lastly, just because you’ve completed a ride on which you’ve taken in a bottle or two of fluids doesn’t necessarily mean that your fluid levels have been replenished. Your body is still burning calories and working to cool itself long after the ride is over, so you should continue to take in fluids during your recovery period. Everyone is different, so listen to your body and drink fluids until you are feeling normal for you. Be safe, ride within your limits, and drink up. Heat cramps are caused by the loss of body salts and fluid during sweating. Low salt levels in muscles cause painful cramps. Tired muscles—those used for performing the work—are usually the ones most affected by cramps. Cramps may occur during or after exercise.